SGInnovate BASH (Build Amazing Start-ups Here) is collaborating with EV Hive, an Indonesia-based coworking space, to build a landing pad for companies from Indonesia and Singapore to enter into each other’s markets. 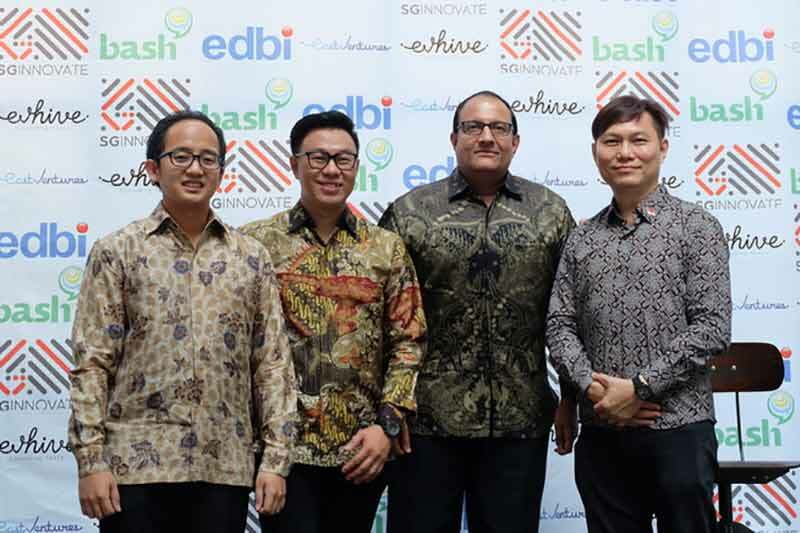 SGInnovate BASH (Build Amazing Start-ups Here) is collaborating with EV Hive, an Indonesia-based coworking space, to build a landing pad for companies from Indonesia and Singapore to enter into each other’s markets. EV Hive is managed by East Ventures (EV), an early-stage venture capital firm with offices in Jakarta, Tokyo, and San Fransisco, which has invested in 150 companies across Asia and the US, focusing on commerce, social, game, SAAS, and mobile services. BASH is Singapore’s biggest integrated startup space managed by SGInnovate, the Singapore government agency developing the innovation ecosystem in the country. Companies based out of Singapore can leverage EV Hive to facilitate their entry into the Indonesian market and vice versa. The partnership will allow members to tap into the networks, spaces and services of the two entities in both Singapore and Indonesia and leverage off the two country’s complementary strengths. Singapore has excellent infrastructure, a robust intellectual property protection regime, and easy access to global talent, while Indonesia has a rapidly growing middle class and a huge and expanding mobile market. Startups in a later stage (Series B and above) can leverage support from EDBI, the dedicated corporate investment arm of the Singapore Economic Development Board, and a partner of East Ventures. The two entities will work on more programmes for talent and knowledge sharing. EV Hive is currently managing two locations in South Jakarta and Bumi Serpong Damai (BSD) helping to facilitate the development of 36 startup companies, six of them originally based in Singapore. EV Hive helps members to focus on their core business, by providing onDemand software such as payroll services and accounting software through partnerships with start-ups offering these back-office services. There are plans for EV Hive to build up to 7 offices by the end of the current year. Minister for Trade and Industry from Singapore, S Iswaran, who was visiting Indonesia from April 24 to 26, was present at the launch. To help Small and Medium Enterprises (SMEs) seize opportunities in Indonesia, Minister Iswaran led a business delegation comprising 10 companies, organised by International Enterprise (IE) Singapore.